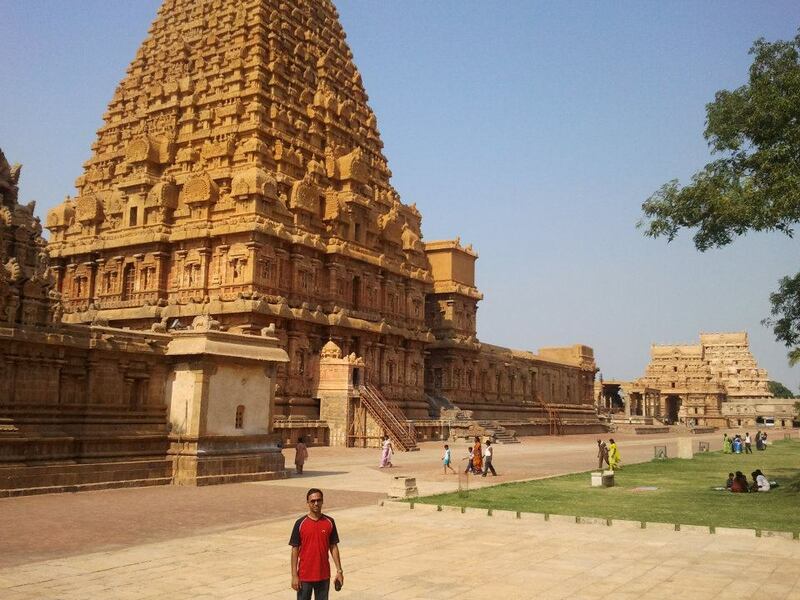 Me looking tiny in front of the Brihadeeswara Temple tower, Thanjavur. Thanjavur is a city located in the state of Tamil Nadu in the region called the rice bowl of India. It is world-famous for the huge and beautiful temples constructed by the kings of the Chola dynasty. The largest of these – Brihadeeswara Temple is situated in the centre of the city. This temple is 1,000 years old and has been designated as a UNESCO world heritage site. On enquiring the next morning, we found that cabs were available to nearby cities at nominal rates. Thanjavur was just a 5-hour drive. I had seen the Brihadeeswara temple in a program on Discovery and heard a lot about it. Since it was so near and we had a lot of free time, we took the cab to Thanjavur. We reached the city at 1.30 pm and found the main temple closed. We came back at 3 pm after visiting a nearby museum. The Brihadeeswara temple was built by Raja Raja Chola I in 1010 AD. Completely made of granite, it is among the largest temples in India. The temple tower is the tallest in the world. When you see the temple for the first time, it really takes your breath away. Although the weather was hot and sultry (winter never comes to Tamil Nadu, I guess), we roamed in the temple complex for 2 hours looking at the beautiful architecture and the massive construction. Then reluctantly at 5 pm, we took the cab back to Pondicherry. This unplanned trip had definitely paid off. We visited Brhuhadeshwara temple in our Tamilnadu trip. The Vimana is awesome. How they raised stones that high as well as how they cut granite without modern tools like diamond tip saws is mystery. You’ll be the first person to say there was nothing much to do in Pondi. :-). I am sure the other members in the gang would disagree to that statement. Nice post. Hope to visit this Marvel some day.